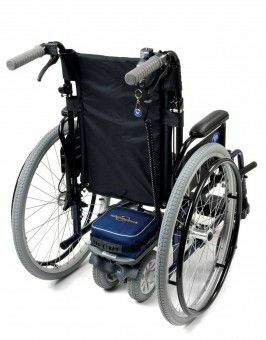 The Heavy Duty Twin Wheel Wheelchair Powerpack attaches to any wheelchair in literally seconds. Once fitted you will never need to push the chair again. Simply walk behind with your thumb on the control and let the Powerpack do all the work for you. The Heavy Duty model was introduced to give more power to push heavier users up to 26 stone and with the added traction of twin wheels enables you to tackle tricky slopes and uneven terrain with confidence. The Heavy Duty model is fitted as standard with the reverse option, operated by a simple switch on the hand control, allowing that extra versatility and functionality which is particualrly important in tight spaces with heavier users. 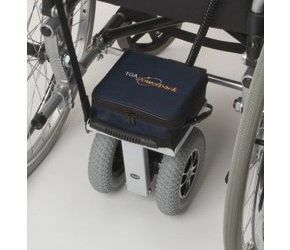 The heavy duty add on power unit is the most technically advanced carer controlled wheelchair power pack on the market. No more struggling up hills, ramps or uneven ground; just press the lever and enjoy the effortless transportation the Powerpack provides. With speeds up to 4mph with up to 26 stone on board and a range of up to 10 miles per charge, there is more than enough capacity for most days out. Light enough to take anywhere; it packs neatly into the holdall and enables you to have that extra mobility from car boot, coach, train, boat and plane. The fully automatic charger simply plugs in to the sealed and maintenance free battery at the end of the day ready for the next day out. This Powerpack comes with everything you need to get out and about, no hidden extras, no complications, even delivery is included. 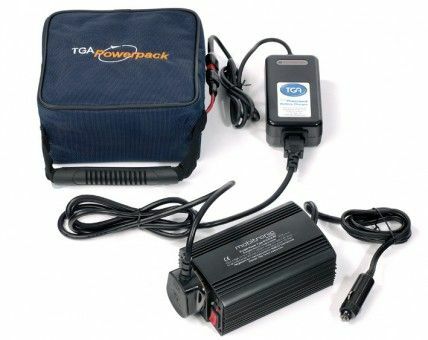 “Don’t Push it... An incredibly simple and reliable alternative to struggling whilst out and about"
In Car Battery Charger - Plugs into standard 12 volt car socket for charging on the move. 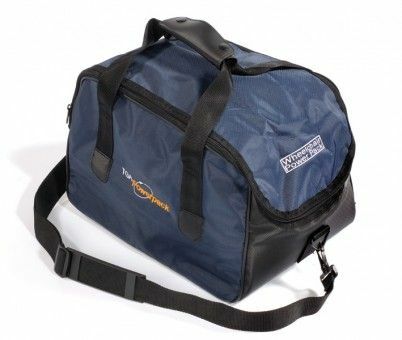 Carry Bag - Carry Bag to carry your power pack on your travels.